Upper Noe has free Wi-Fi? Rec & Park just installed a Wi-Fi transmitter that provides service for patrons. There will be no Open Gym hours on Mondays during July and August. The Municipal Transportation Agency is proposing to reserve two spaces on the east side of Sanchez Street near 30th Street for car sharing vehicles only. This is part of a broad two-year experiment. As many as 900 public parking spaces are to be affected. A public hearing is scheduled for July 18 at 10 a.m., Room 416 at City Hall. More info at sfgate.com. 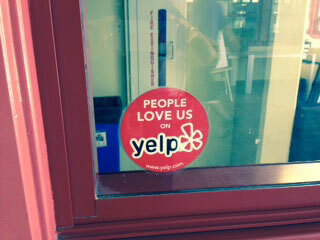 Upper Noe Rec Center has received high marks on Yelp, 4.5 out of 5.0. That does not come easily. 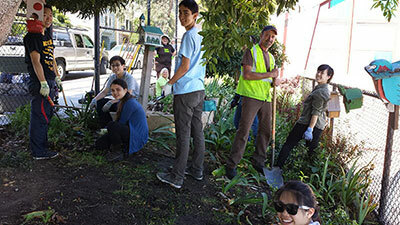 Volunteers donated more than 1000 hours in the past year to keeping Upper Noe beautiful and lively, safe, well maintained, and litter-free. Thanks go out to all of the folk who show up and pitch in. Want to get more involved at Upper Noe? Everyone is welcome to participate in Friends of the Noe Valley Recreation Center (Friends) and the Community Recreation Council (CRC). Friends and the CRC meet together on the third Wednesday of each month from 7-8 p.m.. Our next meeting is July 16. 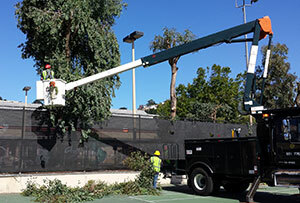 On Friday, June 14, in response to a large fallen branch that landed in the tennis court, RPD promptly deployed a team of arborists to remedy the growing danger from our grove of large eucalyptus trees that stands above the children's playground. Friends and the Upper Noe staff are thrilled with the rapid response time since stories abound in the local media about the shortage of arborist resources and the huge backlog of tree maintenance. Not everyone is thrilled with the severe haircut. The results leave little shade. 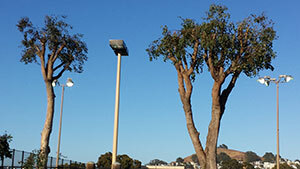 However, unlike the last trimming, which rendered the trunks completely bare, the arborists kindly left a spritzing of greenery. The results are whimsically reminiscent of Dr. Seuss trees. For better or worse, these trees grow back fast. It would be nice if there was a safe, attractive, functional steady state for them but unfortunately, the eucalyptus is not a cooperative species for that. 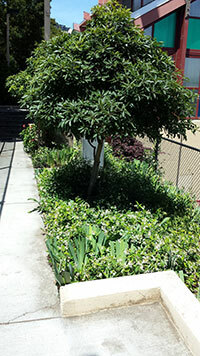 The arborists remove as much as possible when they come to ensure that they do not need to return too soon. So for now, step out into the ball field, look west and enjoy the beautiful view of the hills that the sparse trunks offer. 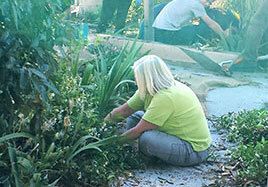 On Saturday, June 14, Upper Noe gardens received a much-needed makeover. Friends’ Joan Lionberger organized a work party of local volunteers and a contingent of cheerful workers from Lick Wilmerding High School. Rec & Park provided a gardener. Together we tackled weeds and ivy, cleared walkways, transplanted a small palm tree and carefully trimmed back overgrown iris in the Ladybug Garden. The students were amazing. While they earn public service credits for volunteer activities, they obviously loved the opportunity to work together. Their enthusiasm and diligence are apparent in the accomplishments. The place is beautiful. The Ladybugs appreciate the helping hands. Right: Anita gets to work. To get involved, contact Joan at ladybugs@noevalleyreccenter.com. The music at the recent Friends Concert in the Park was a bit edgier than usual. 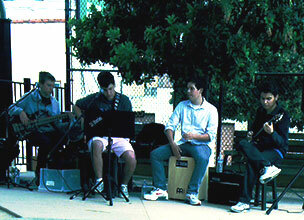 Local teenagers, 12 Stories, brought their electric style tunes to the Upper Noe Playground. While they dialed it back for this event, leaving the big amplifiers and drum kit at home, the tunes retained all of the quality one expects of a rock band. Playing a combination of well-written original songs along with popular covers, they kept it age-appropriate for the young ears in attendance. Well done! This month Friends Concert in the Park welcomes the return of Nina Jo Smith. 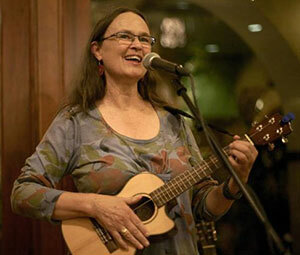 Nina (rhymes with China) is a folksinger with an array of original and traditional tunes. While the rest of the Bay Area swelters at ninety degrees and above, San Francisco’s famous fog puts the freeze on. 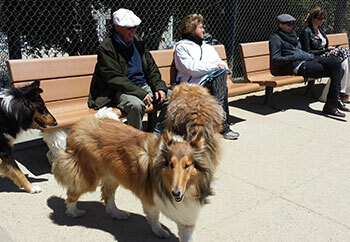 High winds this season have meant bundling up for a sit in the sun. The experimental windbreak installed last year by Friends of Upper Noe Dog Owners Group (F.U.N.D.O.G.) was very effective but not durable enough to withstand the pounding gusts. Recently, the tattered remnants were removed. A more permanent installation is being planned. A free community BBQ / celebration bringing neighbors together in a safe and friendly atmosphere where they can also get to know the law enforcement officers that serve them.